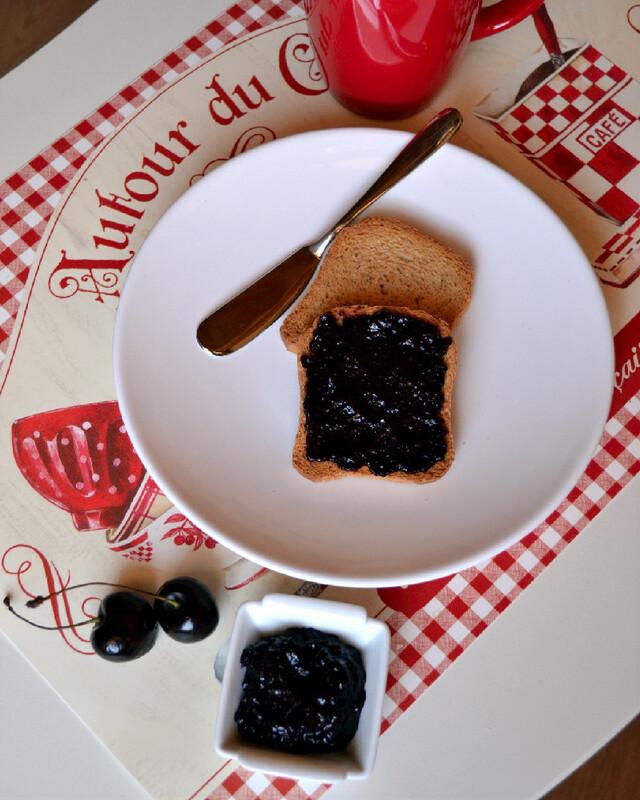 Cherries are in season and I couldn’t think of anything better to make than this Cherry Chia Seed Jam, besides eating an entire kilo of fresh cherries of course. I slept in last Tuesday morning and woke up to find that Mama had gone out, Hubby had gone to Rome for work, and I was home alone wondering where Mama had disappeared to, but pretty certain she had gone down to the open air market that starts at the foot of our building and covers the streets of our neighborhood every Tuesday and Saturday. She loves markets and spends her summer Saturday mornings at them back home in Canada, but I hoped she’d be ok wandering the market here alone, since she doesn’t speak Italian. As Hubby likes to remind me, Mama immigrated to Canada without a word of English in her vocabulary and two kids in tow and did just fine, I think she can handle a walk through the streets of our Milanese neighborhood on her own. She’s a tough cookie. Low and behold she returned shortly after with a report that the streets of our neighborhood were flooded from the overnight torrential downpour and that very few market stands were up and operating. Ouch! I feel for those vendors when things like that happen. She did manage however to pick up some cherries…a whole kilo worth. The market vendors are quite aggressive here and pile the stuff in bags faster than you can say Ciao. I imagine they were even more insistent that day since the flooding likely meant a lot less traffic, if any at all. Hand gestures could only get Mama so far in explaining that a kilo was more than she wanted, so she took the bag and went on her merry way, figuring we’d enjoy them anyways. We all LOVE cherries. When I saw the large bag of fresh dark cherries, I knew we had to make something and jam it was. I suspect they were of the Italian Black Star variety with their deep rich dark red, almost black colour and a notably sweet taste profile. Luckily, Mama pitted the cherries for me. Otherwise, I will have to admit that I’m not sure I would have braved the jam. I hate pitting cherries for the stains it leaves on your fingers and nails afterwards. I really need to pick me up a cherry pitter cause Mama is heading back to Canada soon :-(. This one looks nifty. Any recommendations? Feel free to share them in the comments below. 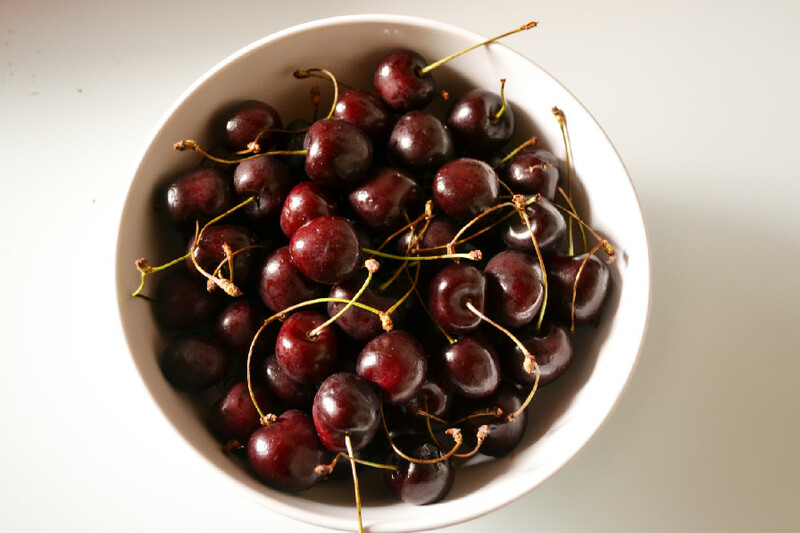 Cherries are loaded with antioxidants, have anti-inflammatory properties and can help reduce the symptoms associated with joint pain and arthritis. They are also a great source of Vitamins A and C, beta carotene, iron and fiber. That’s a lot of punch for such a low-calorie fruit. 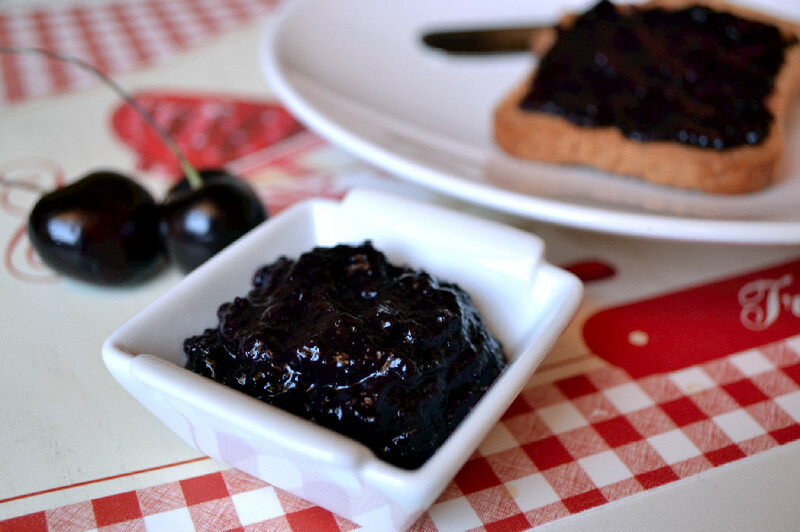 So, if you can look past stained fingers, happen to have a cherry pitter, or your very own mama around to pit them for you, then you really must try this simple 3 ingredient jam recipe. It’s super easy to make and tastes great spread on toast or on steamed bread with tahini, rolled up into a crepe alone or with almond butter, or as a filling for thumbprint cookies (of course I went there and will be sharing that recipe very soon my friends). 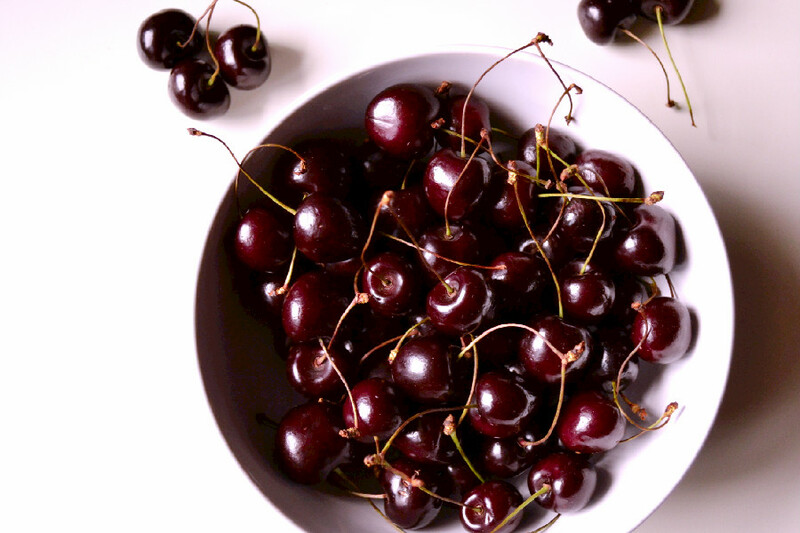 What’s your favourite way to use cherries? Share in the comments below. 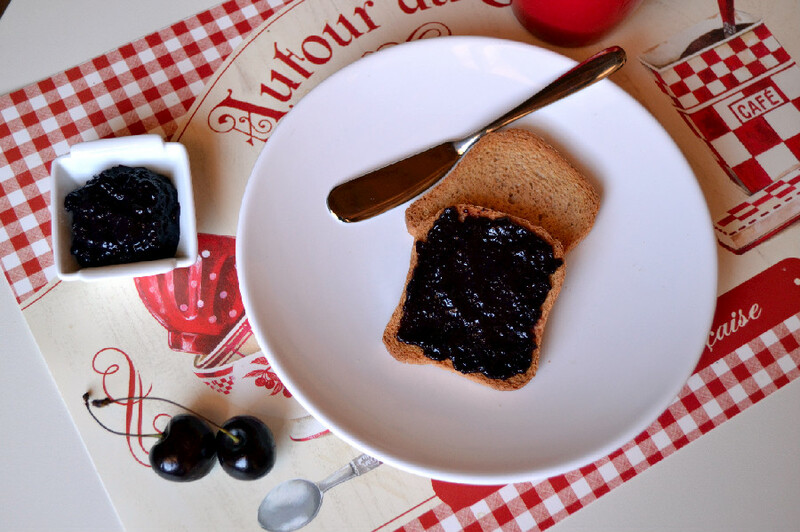 Fresh dark sweet Italian cherries and chia seeds make a great low-calorie, nutritious and delicious 3 ingredient jam. You’ll want to spread it on everything. 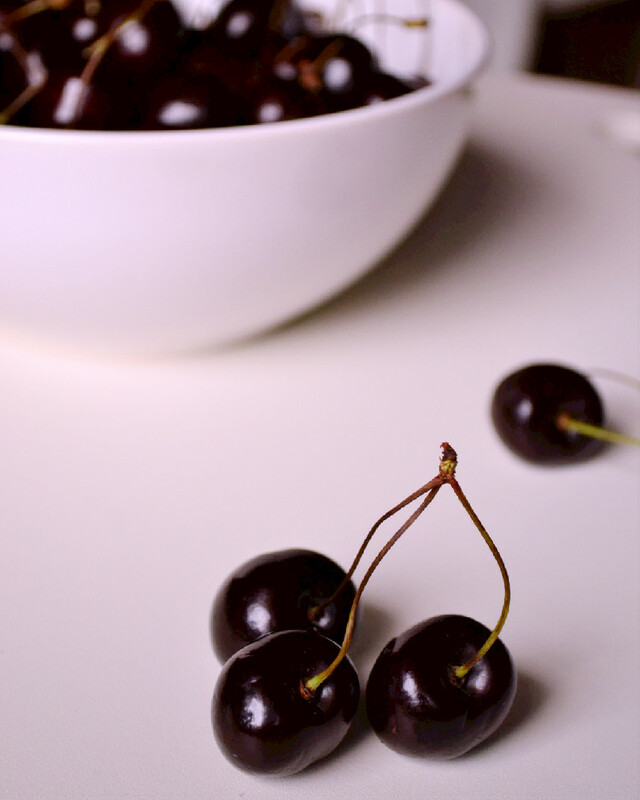 Add pitted cherries and maple syrup to a pot, stir to combine and simmer over medium heat until cherries are softened and broken down, about 15 minutes. Remove from heat, let stand 1-2 minutes until the bubbling has stopped, then puré with a hand blender until smooth. Stir in milled chia seeds and return to heat. Cook over low heat until mixture has thickened to a spreadable jam consistency, about 10 min. Let cool completely, then transfer to a jar or airtight container and refrigerate. 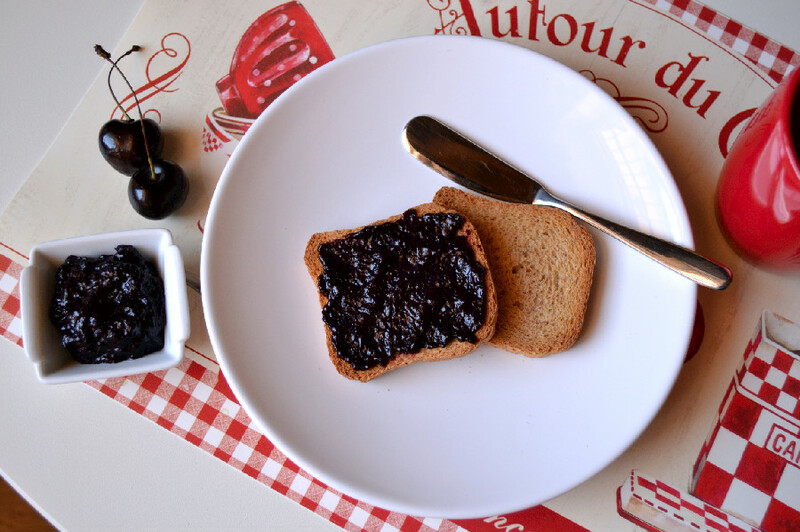 Spread over bread/toast or use in any recipe that calls for jam.